Every time I am in the kitchen using a recipe I’ve found online, I wish I had one, but every time they go on sale I end up skipping it because the Google Home we have is near my kitchen, it has a much better speaker, and we primarily use it to play music, so the Hub is actually a downgrade from the home for us even though it has one feature that would be nice to have. Buy Committee (hint: that’s all of you), scroll down to the comments to share your experiences with smart home hubs and whether you think Methusalah should pick one up. Should he plop down $99 on this super smart digital photo frame, or stick to a smart speaker? I, for one, think he should switch to the Home Hub in the kitchen. I’m still waiting for the Siri equivalent, since I think having a touch interface to interact with a digital assistant is super helpful. 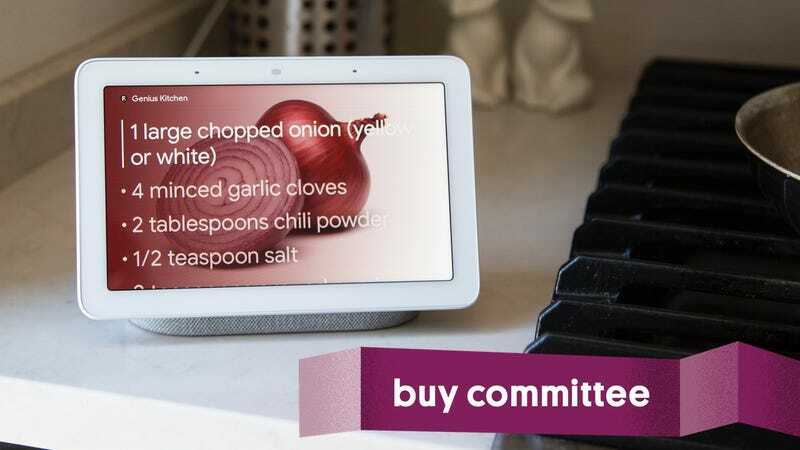 Let’s face it, using only your voice to control podcasts or playlists is pretty clunky, and for common kitchen tasks like reading recipes and watching YouTube tutorials, this just makes sense. Of course, we’re a looking to help you decide on more purchases. So, if you’re still agonizing over something, email deals@gizmodomedia.com with the subject line “Buy Committee” or tweet us at @ItsTheInventory.